INTERESTED PARTIES CALL NUMBER ABOVE OR EMAIL, TO SEE IF ITEM IS STILL AVAILABLE, AND ALL OTHER INFORMATION; EMAIL ME WITH QUESTIONS ON ANY ITEM - YOU'LL GET AN HONEST ANSWER. CALL OR EMAIL TO GET APPROXIMATE SHIPPING & INSURANCE FEES FOR ITEMS YOU WANT TO PURCHASE. SHIPMENT OVERPAYMENTS WILL BE REFUNDED.. MINIMUM ORDER AMOUNT IS $25.00 IN MERCHANDISE. If you are interested in the entire content of the two pages, let's talk. Read description of item before you order, or call Jim at 781-391-4104 to find out further information on item. All sales are final. 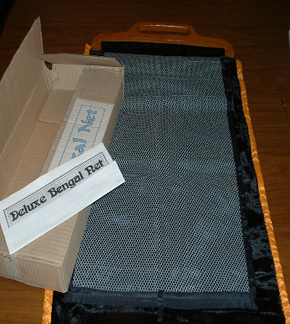 There will be no returns unless item is damaged in transit, in which case there will insurance coverage. ALL ITEMS ARE SHIPPED WITH INSURANCE, except for overseas sales. ITEMS ARE LISTED ALPHABETICALLY & DELETED OR MARKED AS 'SOLD' . 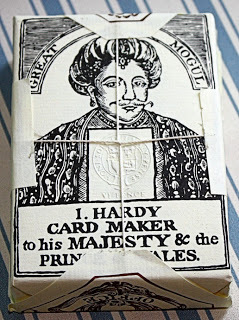 A limited edition deck of playing cards from artist Peter Wood. These full color, transformation playing cards are printed to the highest quality and were limited to 1,000 decks. With very colorful and detailed drawings, this deck is a plus for any card collector or serious card player. This deck is umbered 217 of 1,000 printed. Once these decks are gone, THAT'S IT!! - RARE (Signed and numbered on the inside of box flap) - PRISTINE - $100.00. HAVE ANOTHER DECK THAT HAS BEEN OPENED, BUT NOT USED. Collector's Item. This cabinet was personally made in 1949 in a batch of six, This is an original Herman Hanson made prop. Just as he made them. No Oriental appliques or other designs. BUT WHY WOULD YOU DO THAT??? THIS IS A COLLECTOR'S PIECE. I used it in nightclubs in 1949 and 1950 - then before going into Military Service I placed on a shelf where it has been on display for 68 years. I'm not a collector, but I treasure this piece because it was made by a man I called a friend. I hate to part with it. but time has deemed it so. I'd like to have it go to a person who will treasure it as I have. HAVE 10 DECKS - $20.00 ea. - while they last. 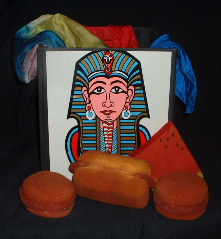 Jack Chanin (1907-1997) was a performer, demonstrator, manufacturer, creator, and magic shop owner. He ran Philadelphia's oldest magic studio, Chanin's Studio of Magic, until 1981. He also performed as an Oriental act under the name Cha-Nin. One deck is of Jack promoting his standard act, the other is of Jack as Cha-nin, an Oriental wizard. Both decks are still wrapped in their original cellophane wrappers. The red boxed one was recently on eBay, selling for $34.95. Get this RARE FIND - both deck for $60.00. 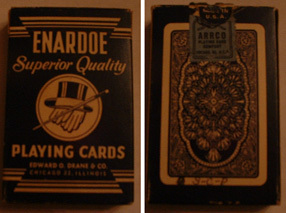 ENARDOE DECK ( VINTAGE STRIPPER DECK - 1940s) By Edward Drane & Co. -This is an original release by Drane, using ARRCO CARDS. The box still has part of the sealing stamp with the ARRCO name. Cards show usage, and the box has some blemihes, but for its ago its in GOOD CONDITION. 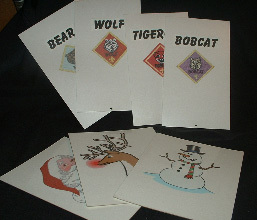 Cards printed on thin stock. Bend easily for back hand productions, etc. SOME INTERESTING DECKS OF CARDS. - - For off-the-beaten-path, presentations, here are some distinctive decks of cards, that lend themselves to specific themes. 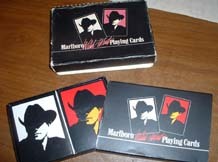 MARLBORO WILD WEST (Promo Decks) Outer box shows wear, but the inside sleeve and card tray are in excellent condition. 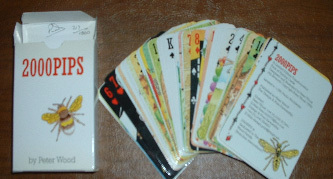 The cards are still wrapped in their original cellophane wrappers. #1 - - AN OPTICAL ILLUSION ON EVERY CARD, along with the normal card indices. #9 - - MAGIC CONVENTION SOUVENIR DECK of the ESTORIL MAGICO, 1996, in Cascais, Portugal. BLENDO BAG - Large colorful - German - Like NEW - Large colorful scarf is fashioned into a bag that can be shown empty. 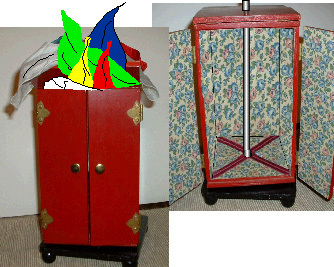 Some colored silks hankies are placed inside, the bag is snapped, and it opens out into the colorful scarf. (No silks included) - With instructions. Originally sold for $75.00 . - - - You can have it for $40.00. 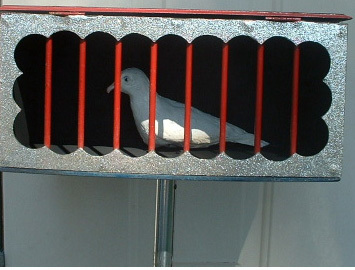 CAGE FOR DOVES - JR - Custom made - one of a kind. MORRISEY PRODUCTS ARE NO LONGER BEING MADE. HERB MORRISEY HAS RETIRED. BE AWARE THAT FUTURE ITEMS WILL BE COPIES MADE IN EITHER CHINA OR INDIA - NEED I SAY MORE. 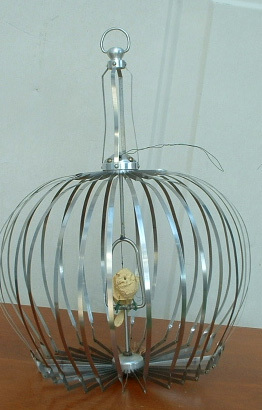 NOTE that cages stand on the table on legs. You can see underneath the cages. No other cages being made offer this feature, until copy-cats come along. custom made (2) Cages do not rest on the table. They are on 4 legs. You can see underneath the cages. Used is standard manner. 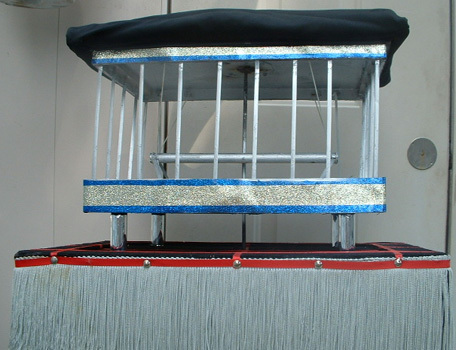 After doves are placed in cage during act, you drape a cloth over the cage, pick up the cage through the cloth, carry it forth, and SWISH - toss cloth into the air, the cage is gone. 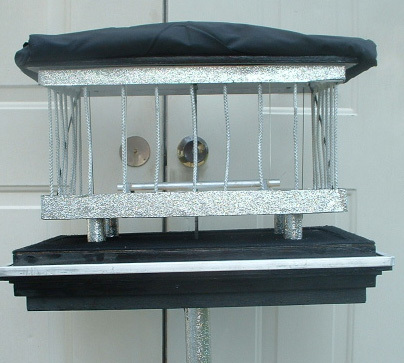 I have two cages, one (photo on left) with fringe decoration around sides and front of cage tabletop , the other, (photo on right) has a table top that bevels in by degrees. Both work pneumatically with control valve to adjust speed of vanish. $100.00 ea. NOTE: Both have to be shipped in two cartons. SIZE: 9" wide X 4" deep X 7 3/4" high. Show box empty. Insert a white hanky into a side hole and run forward corner out of hole on opposite wall., leaving hanky corners protruding from box. Close rear and front doors. To produce dove, yank out the hanky as you release the latch, then open front door and remove dove. CUSTOM BUILT ----------ONE OF A KIND. I only made ONE of this particular size, with special heavy brass base - FOR MY PERSONAL USE! I used in all my 'high-end' shows. THIS IS IT! Candle is 14 3/4" tall - base is 1 1/4" high. diameter of candle is 1 1/4". EFFECT: Tall candle on a stand is on your table. You light the candle, show a long tube, that is absolutely empty and place it over the candle, which leaves the flaming top of the candle in view. You show a paper cone, remove the candle from the tube, leaving it standing on the base. You drop the lit candle into the cone. Show the inside of the cone with the flaming candle inside, then crumple up the cone and throw it aside. Pick up the candle base, remove the tube to show the LIT candle back on the base. We still sell the standard model. See our Simplex Magic Catalog, on the Stage-Parlor Effects page. NOTE: Flame of Kan-Del was created in 1949 with a massive base to hold the battery pack required to fire the nichrome wire available then. 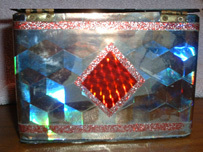 Initially sold through Holden's Magic Shop in Boston. (1960) When Holden's closed up, I made it available to other magic shops. With the arrival of new technology, the candle was modified using only two AA penlight cells and a new ignition system. 13 1/2" square. with 1" wide wood frame. Using four push pins secure a stretched out man's handkerchief to the frame. 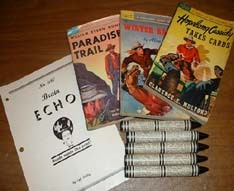 Insert frame into a large envelope and proceed to push pencils through the envelope, and obviously throught the hanky. Then push a large knife and run it sideways across the envelope. 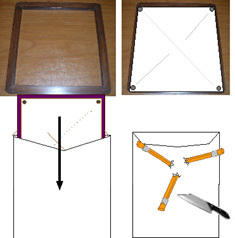 Remove the knife and pencils and take out the frame showing the hanky unharmed. This was a popular effect way back when. This particular frame works beautifully. Gimmick locks in place. Don't know who made it, but it has to be about 50 years old. So, how about a buck for every year. 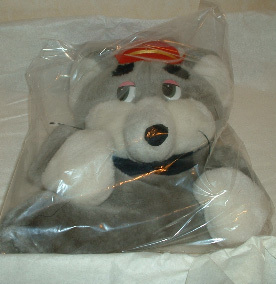 $50.00 - Can be a collectible??????? It's a GREAT VISUAL effect. HORIZONTAL CARD RISE - Cards are selected from a deck and returned to deck. 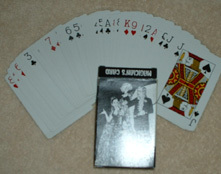 Deck is placed in a transparent plastic houlette and the selected cards move from the middle of the deck, where they were placed, and move to the front of the deck. Average adult size - sits on person's shoulders. 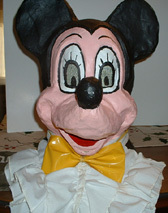 With mesh grill eyes and grilled mouth area so person inside can speak. With large yellow bow tie and triple layer white bib. Very clean. It was always cleaned and disinfected after each use. 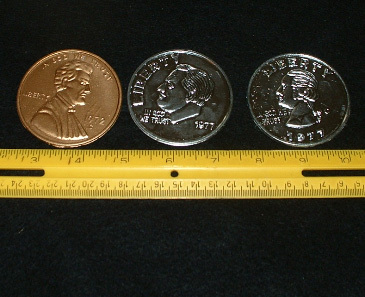 MIDAS COIN BAG (A Deluxe TOM THUMB COIN BAG ROUTINE (have 3) - $10.00 EA. Four pom poms on a long stick seem to be all joined together by pulling on them, But you take the stick apart at the middle to show that there is no connection between ends. - Now selling for $145.00 . Made famous by Ali Bongo and Doug Henning. Stick is 14 1/4" long - Pom-poms are 3" in diameter. 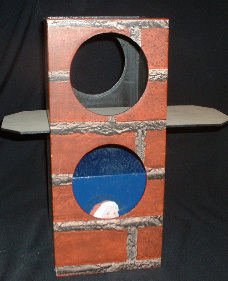 A board is placed across the middle of the chimney, blocking the top portion from the bottom. 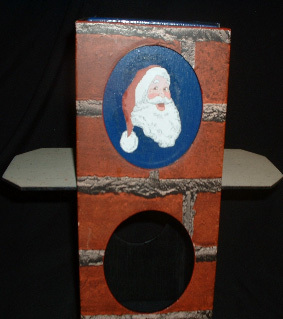 A large block with Santa's head in inserted into the chimney so that it rests on the board. Then at your command, Santa penetrates right through the board, into the bottom of the chimney. Don't know who made it, but its OLD! 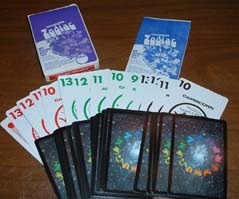 STOP LITE - The original version with 6 3/4" X 10 1/2" cards. Complete with 'WRONG" / 'WRONG AGAIN card. Comes with a customized folder to place the cards into as you do the trick. The front of the folder reads 'TRAFFIC LIGHTS'. When you open the folder for the finaale it reads: 'DRIVE CAREFULLY - THE LIFE YOU SAVE MAY BE MINE. Harry Potter - Panel measures approx 36" x 45". 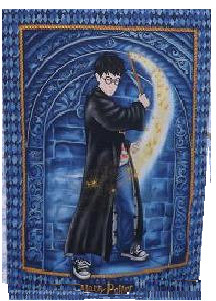 it has Harry with his magic wand flourishing magical gold glitter swirls and stars on blue design background. Panel measures approx 36" x 45". it has Harry with his magic wand flourishing magical gold glitter swirls and stars on blue design background. It is imprinted on bottom with: Harry Potter  & © WB. #9189 Springs Industries, Inc. © This product is intended solely for non-commercial home use. Not intended for use in children's sleepwear. 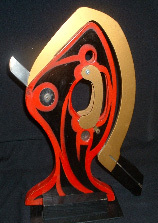 SILVER, COPPER, BRASS - Sells for $69.00 - This one goes for $50.00 - I have three. 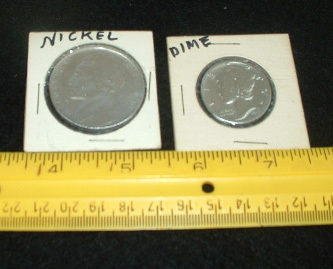 MAGNETIC HALF DOLLAR - Sells for $25.00 - get one for $15.00. I have two. OKITO BOXES - (A) Old style with small hole on top and bottom.